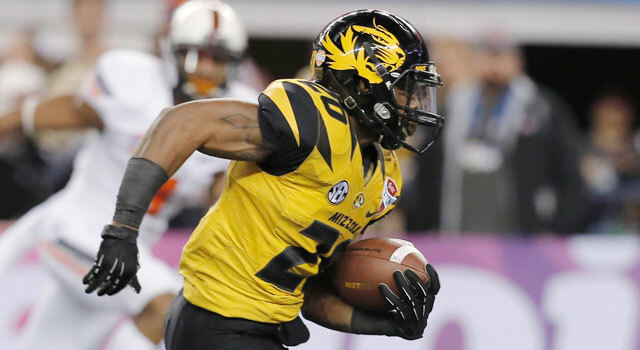 Missouri running back Henry Josey has rebounded from a devastating knee injury. Missouri running back Henry Josey will forego his final year of college and enter the NFL draft, the school announced. Josey rebounded from a horrific knee injury that cost him the entire 2012 season to show scouts this season that his blazing speed had returned through rehab. He rushed for 1,166 yards with 16 touchdowns, and was named the Cotton Bowl Player of the Game for his three-touchdown performance against Oklahoma State. As a true sophomore against Texas in 2011, Josey suffered a knee injury that kept him off the field for more than 12 months, and was likened by coach Gary Pinkel to an injury more common in an automobile accident than on a football field. Josey's road to recovery was a long one, but he returned this season as an integral part of one of the SEC's most prolific offenses. Missouri won the SEC East, and Josey proved his health. "I can't possibly express how much I owe to so many people for helping me get to this position, my doctors, trainers, strength coaches, everyone who pushed me and helped me and believed in me, and of course my coaches for trusting me," Josey said. "To the Mizzou fans, thanks so much for all of your prayers and thoughts the past couple of years, you truly inspired me to get back on the field." While questions about Josey's knee may be answered, questions will be raised about his size. At 5-foot-10, 190 pounds, he figures to be more of a third-down option at the NFL level than as a starter at running back. His speed, however, could translate nicely on special teams, as well.